Nissan CEO Carlos Ghosn says the Leaf is not intended for all driving needs but is practical for many drivers around the world, including the expansive U.S. landscape, since most daily commutes are less than 50 miles. Nissan Motor Co. is considering a deal-sweetener as it prepares to launch global sales of the all-electric Leaf: free rental car use for trips beyond the Leaf's 80-100 mile battery range. The idea is only under study at the moment, according to Nissan North America spokeswoman Katherine Zachary, and it concerns markets other than the United States. She said it is primarily being considered in markets, including Europe, where households do not routinely own a second vehicle. She said there are no details yet of how such a free rental-car service might work. But the notion of supplying new-car customers with the free use of a second vehicle indicates the real-world challenge that electric-vehicle manufacturers face in introducing cars like the Leaf. Critics believe that battery-powered electric vehicles do not satisfy the needs of most drivers, since the batteries must be recharged every 100 miles. That makes them impractical for cross-country trips, or even shorter day excursions where the round-trip distance exceeds 100 miles. Executives at other automakers, including General Motors Co., believe customers need a greater driving range. The Chevrolet Volt that is scheduled to launch next month relies on a battery for only 40 miles of driving range, and then switches to a gasoline engine to run electric motors in the car for an additional 300 miles. 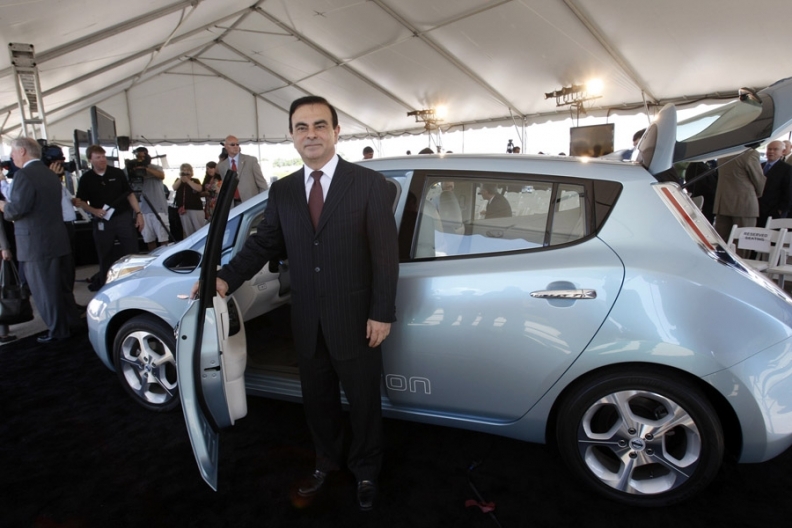 Nissan CEO Carlos Ghosn has maintained that the Leaf is not intended for all driving needs. When it goes on sale in selected markets in the United States in December, Nissan dealers will be expected to direct customers who routinely drive long distances away from the Leaf. But since he inaugurated the Leaf program globally two years ago, Ghosn has said that the Leaf is practical for many drivers around the world, including the expansive U.S. landscape, since most daily commutes are less than 50 miles. Customers who buy the Leaf must agree to have a battery charging system installed at home before they can complete the purchase. And cities and states from Tennessee to Oregon are planning to install thousands of public charging stations for electric vehicles. But a full battery re-charge can take up to eight hours, depending on the type of system being used -- not the type of roadside pit stop drivers would expect to make on their way to a business meeting or a holiday visit.